Capture document approvals electronically and build confidence and trust across the team. Document approval procedures in Document Locator make it easy to know which files are final and approved, who made the approvals, and the complete document approval history. Approval processes support the accurate recording of acceptance or agreement in business documents, policies, work instructions, handbooks, and more. Document approval steps are designed to support business requirements for efficient reviews. Automatically route notifications and documents to one or more people for their acceptance and sign-off. As files are electronically routed, approvals are recorded in the system. Approval routing actions can be configured to automate tasks based on approval status. Everything is recorded in an audit trail that can be reviewed and analyzed in reports. Approvals are a core component of workflow, and a cornerstone of effective process management. Combined with version control, a complete history of prior approved documents is maintained – supporting retention regulations and limiting legal liability. Route files electronically in document approval steps. 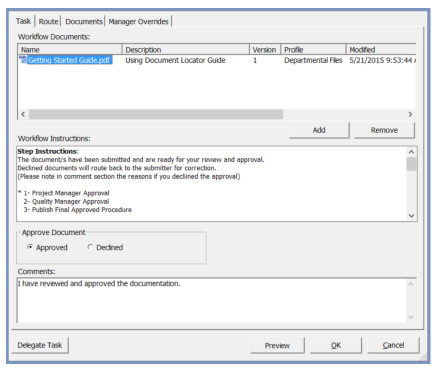 Capture a record of document approvals and a complete history of approval workflow. Speed up document approval processes by automating notifications and reminders. Use approval steps in individual or group collaboration as well as sign-off procedures. Track the status of documents in review and approval steps. 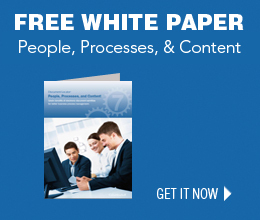 Replace ad-hoc and inconsistent approvals that rely on paper or email.